There are many Bible stories from the Old and New Testaments during this season. Summertime can be a time to develop creative intergenerational programming that builds builds week upon week. Storytelling, enhanced by simple dramatics, creative writing, painting, and other experiences, can be fully explored. The “Common Lectionary” breaks away from the thematic harmony principle (which is another lectionary track that will not be followed on this site) of all the Sunday readings during this long season of the church year. In Year A we will be exploring stories of our roots (Genesis) and liberation (Exodus), a semi-continuous reading of the biblical story beginning with the call of Abraham and Sarah to the death of Moses (along with readings from Matthew). Today we begin that journey, with a story that is often hard to comprehend: Abraham’s (almost) sacrifice of Isaac. God puts Abraham through a remarkable test of his obedience and trust by asking him to sacrifice his only remaining son, Isaac. God reaffirms the earlier promises of many descendants because of Abraham’s extraordinary obedience and trust in God. Since Pentecost was late this year, we’ve missed the readings leading up this today’s passage. Proper 7 is when Abraham and Sarah send Hagar and Ishmael away. The testing of Abraham goes to the heart of Abraham’s life, his hope for meaning, and his trust in God. He is about to give up his only child, on whose life fulfillment of God’s promise depends. God is shown to us as the Lord who demands are absolute, whose will is inscrutable, whose final word is . . . grace. The nature of God is revealed in the moment that God stops Abraham’s hand from harming Isaac and prevents the sacrifice. Abraham is not blessed for correctness in discerning God’s will; he is blessed because he thought he knew God’s will and was willing to obey. The truth is that the dedication that God desires is not to death but to life. What is asked by God is something different: oneness between the heart of God and the heart of the person. As part of the family of God, we also strive toward that oneness. Hopefully, we may not have to face the same decision Abraham faced, but we do face decisions in our everyday lives about how much we want to control our own lives and how much we are willing to let God lead us. In telling this story with children, read through the story (Genesis 21:1-7 and 22:1-19) from the NRSV. There is a lot of emotion that you can bring to the surface: fear, doubt, incredulity, dread, trust, love and faith. Use your tone of voice to express the moods. 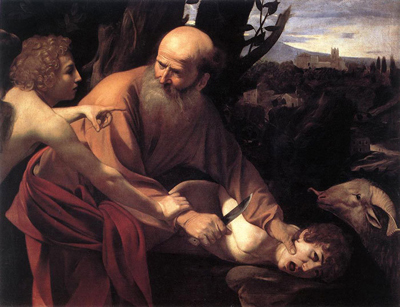 Children will easily identify with the boy Isaac, especially when he is bound and laid on the altar with his father’s knife above him. Be sure to emphasize the point of the story, which is that God did not allow the sacrifice to take place, and that God was testing Abraham’s readiness to obey God. This entry was posted in Ordinary Time and tagged Abraham, Binding of Isaac, Book of Common Prayer, Discipleship, Faith, Lectionary, Season After Pentecost, storytelling. Bookmark the permalink.